This top airflow subohm tank from smok is designed to produce massive flavour and copious amounts of vapour while keeping your pockets dry with it’s top airflow anti leak design. Need something basic and easy to use? This is it! SMOK introduces their newest TFV series sub-ohm tank, the TFV8 X-Baby Sub-Ohm Tank with top airflow. The TFV8 X-Baby Sub-Ohm Tank retains the same functionality as the world famous baby beast tank, such as a hinge and lock top fill system, but is capable of holding up to 4ml of E-Liquid. Included with the TFV8 X-Baby Sub-Ohm Tank are two X-Baby Coil Family Coil Heads: an X-Baby M2 Coil Head and an X-Baby Q2 Coil Head with wattage ranges of 30 to 50W and 40 to 80W respectively. Airflow enters the TFV8 X-Baby Tank via dual adjustable top airflow, with each airslot measuring at 16mm by 2mm and the 8.5mm delrin drip tip allows for ample vapor intake. 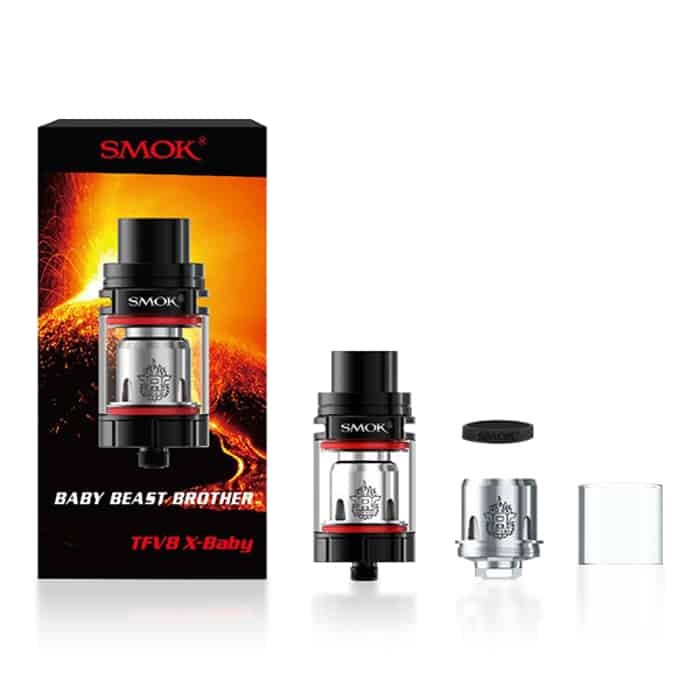 The X-Baby TFV8 Sub-Ohm Tank, also known as the Baby Beast Brother, is SMOK’s first top airflow tank and is a top contender on the market, alongside the rest of the TFV series. I Own 3 Of these, They Are Great tanks, great value for money.